Montezuma-Cortez School Superintendent Alex Carter and Montezuma-Cortez High School Principal Jason Wayman applaud the voters who passed the bond issue for the new building. 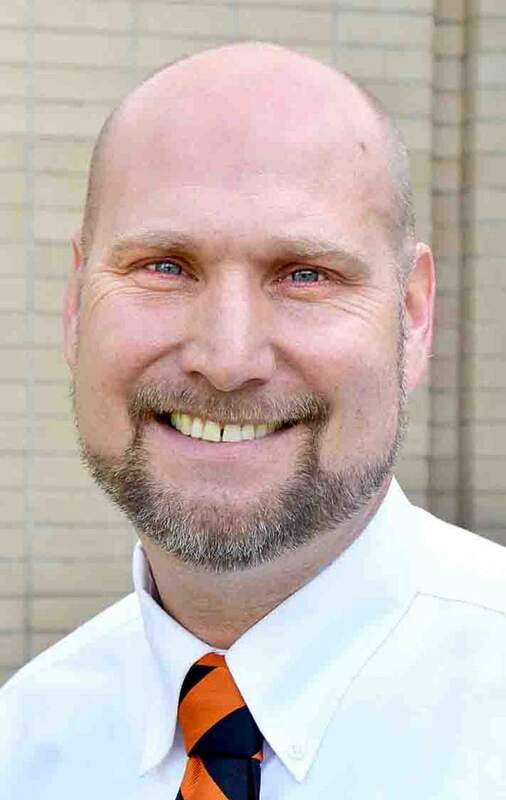 Montezuma-Cortez Re-1 Superintendent Alex Carter announced his resignation Friday in an email to teachers. In a 289-word email sent Friday, Carter told teachers that he has accepted an undisclosed position at the Colorado Education Initiative, stating the organization’s mission was “closely aligned” with his professional purpose. The Colorado Education Initiative is a nonprofit that collaborates with the Colorado Department of Education and schools and districts across the state to accelerate achievement for all Colorado students. “As thrilling and as rewarding as this new opportunity will be for me both personally and professionally, my heart is heavy with the thought of leaving the many great friends and colleagues I’ve had the fortune to work with these past four years,” Carter wrote. Telephone calls to Carter and Assistant Superintendent Lori Haukeness on Monday were not returned. Schools were closed because of the Martin Luther King Jr. holiday. “I’m sorry to see him go,” Re-1 board president Jack Schuenemeyer said via telephone on Monday. Schuenemeyer said “great progress” was made under Carter’s leadership. He pointed to construction of a new high school, improved graduation rates and a University of Virginia turnaround program targeting the district’s three in-town elementary schools. Carter stated in the email that Re-1 schools were headed in the right direction, and it had been an honor and pleasure to work alongside dedicated staff, teachers and leaders. “We are on track to fulfill the district’s vision of being a beacon of educational excellence for others to admire and emulate,” he wrote. In the email, Carter said details of his resignation and the district’s transition strategy would be discussed in a closed session when the school board convened on Tuesday, Jan. 19. In Carter’s administration, the district opened a 152,000-square-foot high school. 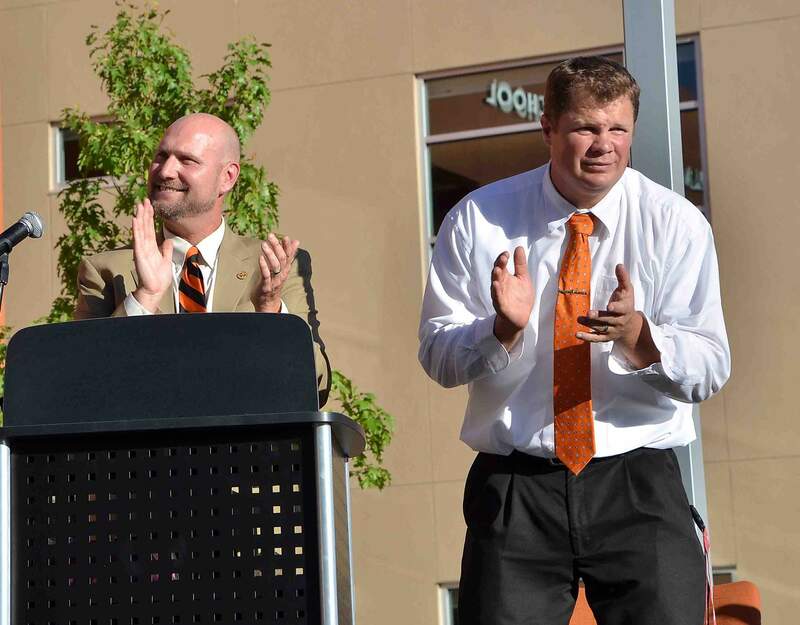 The community celebrated the $41.5 million investment in August. At that event, remarks from Ute Mountain Ute elder Terry Knight of Towaoc offered a warm welcome. “This is a school that we can all be a part of,” said Knight, who recalled a more racially contentious era in the 1960s when he attended the school. Carter later highlighted Knight’s statement, noting that attitudes were shifting. That upbeat energy, however, began to fade as Carter faced scrutiny on multiple issues. Within weeks of opening the high school, Carter informed city officials that the district failed to properly budget for the demolition of the old Montezuma-Cortez High School building on Seventh Street. When applying for a grant and bond measure in 2012 to finance a new high school, Re-1 officials vowed that the old Seventh Street high school would be flattened. That plan was shelved because of unforeseen asbestos abatement costs, Carter said. Carter was hired as Cortez-Montezuma school superintendent in 2012 and paid a salary of $115,000. He previously served as principal at Telluride High School and Brentsville District High School in Virginia. He also was the former chief academic officer for TVtextbook.